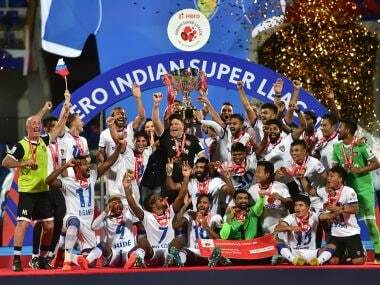 Ultimately, after dominating the league throughout the season, Bengaluru FC faltered at the finish line as Chennaiyin FC beat the Blues 3-2 to be crowned Indian Super League champions. The Marina Machans now join ATK as the most successful ISL side with two titles. 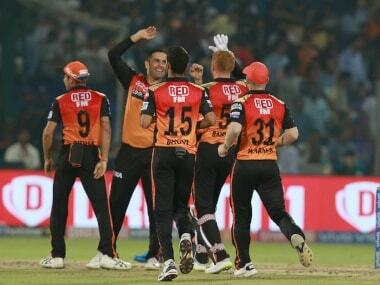 Going into the final, Bengaluru were up against history as no team that had topped the league table had ever won the title. 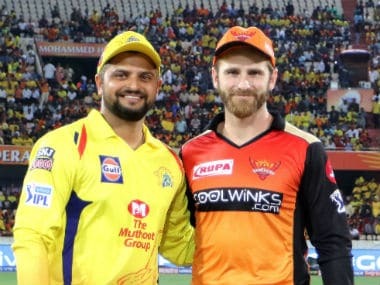 Neither had any team playing the final in front of their home fans had ended up finishing on the winning side. The Sree Kanteerava was packed to the rafters by the Bengaluru faithful who made up most of the 25,000 people in the stadium. Close to 700 Chennaiyin fans had made their way to the final but they were comfortably outnumbered by the home crowd. With Subashish Bose out due to suspension, Albert Roca decided to tinker with his formation and started Erik Paartalu in a three-man defence alongside John Johnson and Junanan. The Aussie has been an imposing figure in the Bengaluru midfield this season and Roca's decision to play him in a more defensive role allowed Chennaiyin to win key battles in midfield. The withdrawal of Dimas Delgado just before half-time added to Bengaluru's misery. Bengaluru started brightly in front of their home fans and Sunil Chhetri gave them the lead in the 10th minute with a well-taken header. Udanta Singh, who caused Chennaiyin a lot of trouble on the right flank, beat his marker Jerry Lalrinzuala to put in a cross towards Chhetri, who cushioned his header past Karanjit Singh in goal. To their credit, Chennaiyin never looked out of place and were not overwhelmed by the hostile crowd at the Sree Kanteerava stadium. Seven minutes later, they got their equaliser. Mailson Alves rose highest to direct a powerful header past Gurpreet Singh Sandhu from Gregory Nelson's pinpoint corner kick. Despite conceding, Bengaluru had more of the possession with Udanta particularly causing trouble for Jerry on the right flank. The Manipuri winger's link-up play with wingback Rahul Bheke looked to threaten the Chennaiyin defence but they held firm. Inigo Calderon, who has been a rock in the Chennaiyin defence, erred in clearing the ball from a cross but the Spaniard was quick to make up for his mistake with a goal-line clearance off Dimas' shot. John Gregory, in his pre-match press conference, had marked Chhetri and Miku as Bengaluru's danger men and despite both getting on the score sheet, the Bengaluru attackers were shackled by the Chennaiyin defence for a large duration of the match. Despite getting the ball in good areas, the Bengaluru forward line's final pass was poor. Bengaluru were pegged back when Dimas hobbled off due to injury just before half-time and their agony was compounded when Nelson and Alves combined from a corner yet again to silence the fortress at half-time. Bengaluru started the second half on the front foot but it was Chennaiyin who had the first real chance of the half. Five minutes into the second half, Jeje Lalpekhlua did well to win a long ball and his pass found Nelson. The Dutchman turned his marker to shoot but Gurpreet was quick to get down low and palm away the shot. A minute later, Bengaluru should have had their equaliser but for a contentious offside call. Udanta sped past Jerry and get on the end of Miku's through pass. His cross took a huge deflection off Alves and lobbed over Karanjit. The Kanteerava crowed was up on its feet only to see the linesman signal for offside. However, replays suggested that Udanta had timed his run perfectly to get past Jerry. As the half went by, John Gregory's tactic of absorbing the pressure and hitting Bengaluru on the counter became evident. Wave after wave of Bengaluru attack was repelled by a resolute defensive structure. Dhanpal Ganesh and Bikramjit Singh did well in front of the defence to deny Bengaluru space. The introduction of Anirudh Thapa after the hour mark gave Chennaiyin the legs to launch counter-attacks from midfield. Bengaluru's search for an equaliser meant that they pushed players higher up the pitch freeing up a lot of space behind for Chennaiyin to exploit. And they did just that in the 67th minute. On the counter, Jeje got to the end of a Nelson pass and he managed to hold the ball despite pressure from Johnson. The Mizo striker then laid the ball off for Raphael Augusto to curl it beyond a diving Gurpreet. Bengaluru desperately tried to claw their way back into the match but the Chennaiyin defence stood firm. 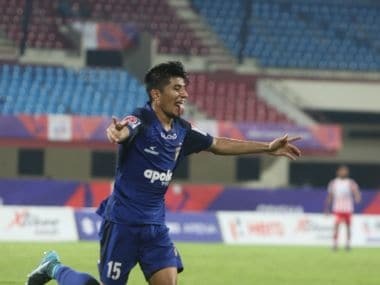 Chhetri's header in the 73rd minute was palmed over by a backtracking Karanjit and the Bengaluru skipper squandered a golden opportunity in the 85th minute. Henrique Sereno's slip allowed Miku to cut back the ball to an unmarked Chhetri but the normally reliant forward skied his shot. Miku's header off a beautiful Udanta cross reduced the deficit for Bengaluru in the 92nd minute but it proved to be too little too late for the Blues as Chennaiyin held on to secure a famous win at Bengaluru's fortress. Although Roca was hampered by suspensions and injuries, his ploy to play Paartalu in defence and relinquish control in the midfield that the Aussie has provided through the season, backfired on him. In contrast, Chennaiyin's John Gregory got his tactics spot on and despite playing in front of a partisan crowd, his players never buckled under pressure.